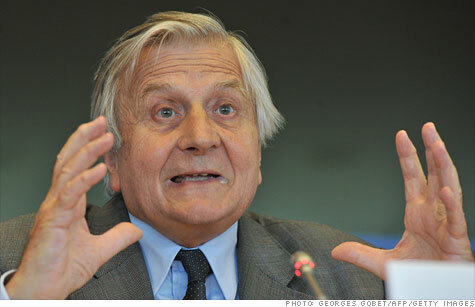 European Central Bank president Jean-Claude Trichet has urged EU policymakers to implement measures to contain the region's sovereign debt crisis. NEW YORK (CNNMoney) -- After a summer fraught with uncertainty, investors in Europe returned this week from holiday to find the eurozone sovereign debt crisis may actually be getting worse. The European Union made a grand gesture in July, promising more bailout money for Greece and pledging additional support for other nations with massive debts and weak economies. But the situation has deteriorated since then. In August, stock markets across Europe went into a tailspin thanks to a deteriorating global economic outlook. The pain did not let up on Monday, with stocks plunging in London, Frankfurt and Paris. European shares briefly rebounded Tuesday after the Swiss National Bank moved to stabilize the nation's currency. But stocks in Europe turned lower again as the day wore on. Investors remain worried that the 12-year-old euro currency may not survive the crisis in its current form. "We believe that we are just about to enter a critical period for the eurozone and that the threat of some sort of break-up between now and year-end is greater than it has been at any time since the start of the crisis," said Alastair Newton, a fixed-income strategist at Nomura Securities in London. The European Central Bank, which expanded its bond-buying program last month to include debt issued by Italy and Spain, appears to be the only thing keeping a lid on sovereign debt markets. But the controversial ECB program bends certain EU rules and analysts say it cannot be sustained indefinitely. That makes implementing the proposed expansion of the European Financial Stability Fund even more critical. On Monday, yields on Italian bonds rose amid worries that Rome may backtrack on recent belt-tightening plans. German bond yields eased as investors flocked to safe-haven assets. As part of the July agreement, EU leaders announced plans to authorize the stability fund to buy government bonds in the secondary market. The move, which must be approved by all 17 eurozone nations, was cheered initially. But many analysts say there is not enough money in the 440 billion euro fund to do the job effectively. "The ECB is providing a stop-gap until the newly expanded EFSF will get up and running," said Nick Stamenkovic, market strategist at Ria Capital Markets in London. "But investors are still dubious that fund is properly large enough." The proposed expansion is expected to be ratified by parliaments in Germany, Finland and Belgium this month. Investors are also awaiting a key verdict Wednesday from the German Constitutional Court on the first bailout for Greece. The court is not expected to rule that last year's 110 billion euro rescue was illegal, but analysts say it could set conditions for future bailouts. "While we expect all of the measures to be approved eventually, any delay in the process, or the risk of it, could further unsettle the markets," fixed income analysts at Bank of America Merrill Lynch wrote in a research report. Shares of Europe's biggest banks have already been pummeled. The banks hold billions of euros worth of government debt and investors are unsure how much those bonds will be worth in the future. The panic selling last month has prompted worries that there could be a run on one or more major European financial institution. Eurozone leaders, for their part, maintain that stress tests conducted in July demonstrate that European banks have sufficient capital. Meanwhile, the second bailout for Greece has been threatened by political infighting. The 109-billion package of low-cost loans announced in July was called into question last month after Finland and Greece reached a controversial agreement for Athens to put up cash collateral against loans from Helsinki. The move prompted Austria, the Netherlands and other well-to-do eurozone nations to call for similar collateral deals. Eurozone leaders have rejected the bilateral agreement and criticized Finland for catering to anti-EU political forces. Eurogroup President Jean-Claude Junker has said that eurozone finance ministers are working on an alternative agreement, but the situation remains uncertain. To make matters worse, reports surfaced last week that Greece may not be able to meet the fiscal targets set out by the European Union, International Monetary Fund and European Central Bank. The Greek Finance Ministry issued a statement Tuesday saying talks with this so-called troika ended "positively." Greece has struggled to implement harsh austerity measures aimed at reducing unsustainable budget deficits and meeting conditions for its bailout loans. The lack of progress has increased tensions between Greece and its European benefactors. The latest setback came after Greece signaled that it would not go forward with a proposed bond-swap with private sector creditors if the participation rate fell below 90%, raising questions about a key component of July plan. Will Europe come tumbling down? "It's incredibly frustrating," said Natascha Gewaltig, director of European economics for Action Economics in London. "They announce this big thing and then it never happens -- or it does happen but it's followed by weeks and weeks of discussion and things get watered down." The uncertain political situation in Europe comes against a backdrop of economic gloom. In the second quarter, gross domestic product for the 27 members of the European Union rose just 0.2% compared with the second quarter. But more recent data suggest the eurozone economy will probably avoid a recession, said Alan Brown, chief investment officer at Schroders in London. He argues that some European stocks are trading at significant discounts, assuming economic conditions don't deteriorate further. In addition, Brown said trading volumes will likely increase early this month as investors return from vacation, which could put a damper on market volatility. "After the astonishing volatility in August, we're likely to have a temporary respite in September before feeling more pain later on in the year," he said. "While I do believe that the eurozone will reach a day of reckoning, I don't think that day is with us yet."